Key West is a tropical paradise with beaches on the Florida Straits and the Gulf of Mexico. It’s hard to pick which one is “the best,” as they all have unique advantages. Some beaches are rocky, some are sandy and some are very far out to sea. Everyone has their own personal preference, so here at 24 North Hotel we’ve included the top 3 beaches in Key West. Decide which one is the best fit for you. 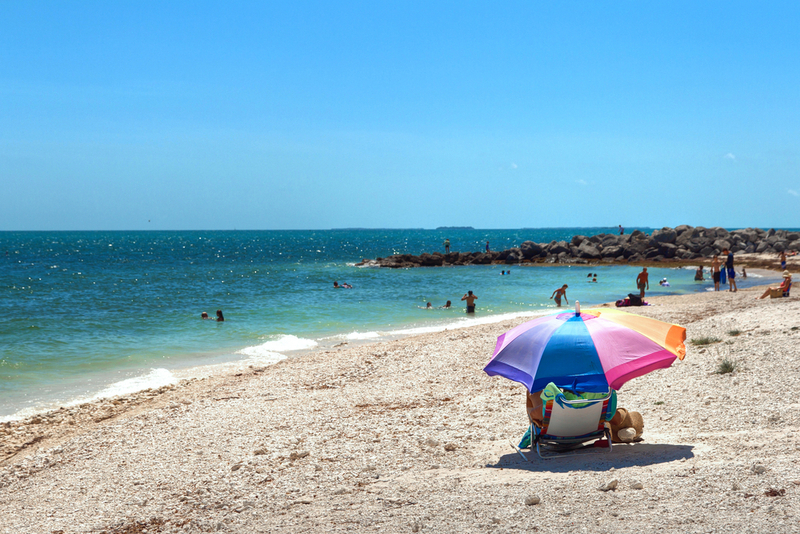 Fort Zachary is a beach for snorkelers and those who like to interact with the beach, rather than visitors who want to soak up the sun. Located right near the Civil War-era Fort Zachary Taylor, the park features bike, walking and running trails, and its pristine Caribbean waters are a favorite among snorkelers. There is an entrance fee for cars or visitors can walk or bike with a fee of $2.50. Note: Fort Zachary Beach offers beautiful views, but it is very rocky. Visitors should bring water shoes if they plan to comfortably navigate around the water and beach. Likewise, pack food and drinks, as options are limited. Grills for BBQs are available. The park opens at 8 a.m. and closes at sunset, so plan accordingly. The largest public beach on the island, Smathers begins at the zero-mile marker and stretches along New Town, just three miles from 24 North. The beach is sandy, which is a nice reprieve from the rocky beaches found elsewhere on the island. Coconut trees line the beach and the view of the deep blue Florida Straits is breathtaking. Volleyball courts are also available for use. This beach is perfect for those into sunbathing or watersports. Sunset Watersports rents out paddleboards, catamarans and more. For visitors more into lounging, beach chairs and umbrellas are also available for rental. Note: Get to Smathers early to snag a spot in the coveted shade of a palm tree. Also, there are a few great food trucks lined up along the beach (Check out Leila’s Latin Food), but the beach is remote compared to the rest of the island. Pack a cooler with cold drinks to get the most of your visit. Parking is free on the street. This park is quite the trip from Key West, but a daily ferry can help you make it in a day. While history makes up a lot of the draw to visiting this park, it is also favored for its beach and snorkeling opportunities. The beach is remote, with clear waters, and seashells, sea turtles and historic artifacts are regularly spotted by snorkelers. Visitors typically book with Yankee Freedom III, which offers snorkeling gear and lunch. The ferry sets out at Key West Bight and it takes just over two hours to arrive to the island, with 4 hours for visitors to check it out. It makes for a great day trip for the family. More info here. Note: Any shells or artifacts visitors find must be left behind, as the island is protected by the national park services. This helps keep the area pristine and untouched for future visitors. Booking a stay in Key West? Check out 24 North Hotel's special offers.